With Tiger Woods PGA Tour 14, EA Sports is attempting to leap into the rarefied air of sports games like NBA 2K12 by mixing in great gameplay of today, while mixing in great historic stories and players from the past. Does adding Gary Player, Ben Hogan, Bobby Jones and Lee Trevino make this game a Birdie, or leave you feeling out in the sand? 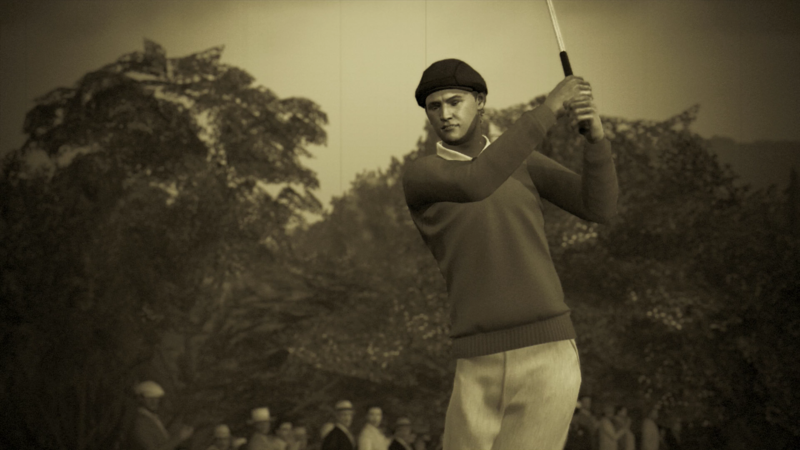 The major new mode in this year release is the Legends of the Majors, in which you some of the most memorable moments in golf history through six eras dating back as far as 1873 with Tom Kidd winning the first Claret Jug. One of my favorite things is the presentation of this mode; of course there is classic sepia tone, but also old timey graphics and clothing. My personal favorite part of the presentation of this mode is using the clubs of the time such as a Jigger, Niblick, Baffing Spoon and the great sounds each of them make. To bring back the analogy to the NBA 2K series, Legends of the Majors following Tiger 13’s Legacy Challenge, where you played through Tiger’s life, is much like how NBA 2K12 followed up 2K11’s Jordan Challenges with NBA’s Greatest mode. In the end, it’s a great single player experience that shows you how far golf has come in the last 140 years. This year is also the first time that all four Major Championships have come to the Tiger Woods PGA Tour series. Being able to have the official branding for them is just the extra boost needed to make your career feel as authentic as possible. My favorite expansion of an existing mode has to be what they have done with the Country Clubs. Last year we were limited to only 25 club members, this year that number has quadrupled to 100. They have also added the ability to have in-game chat with members of your club even if you aren’t XBL friends with them. As someone who runs a country club my biggest issue is that there is still no way to create tournaments on the console. You still need to log into EASports.com to set them up. Another great expansion of an existing mode is the addition of the LPGA Tour into career mode. No longer is this just for the boys. Now you can battle for a Championship with the ladies going against some of the best women in golf today, including Paula Creamer, Natalie Gulbis and Lexi Thompson. The only drawback to this is that there are only a total of 5 licensed female players. Hopefully that can change in the future. 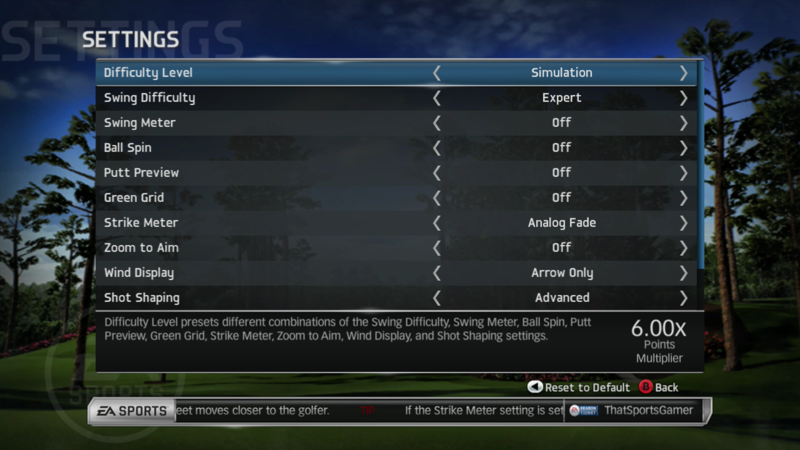 A new enhancement to your created golfer is the ability to set your own Golfer Swing Style. These settings give you the option of choosing if you are a power or control golfer, if you play a draw or fade, and what trajectory the balls flight will have. These also play into the Advanced Shot Shaping, for instance if your player has a draw, you will have to move your shot stick in correlation with that. The new Golfer Swing Styles are not only used on your created player, but also on the pros in the game. You better have your game game down pat if you are ready to try out Tiger’s new Simulation difficulty. I prefer to call this difficulty “Realistic”, because much like in real life, it’s going to take a lot of practice to shoot under 100. 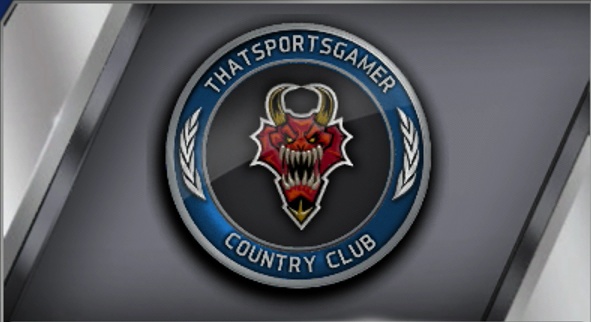 I think this mode is going to be great as you progress through Tour Pro and Tournament difficulties. The hardest part for me in Simulation is that you are on your own trying to read the greens, which can be extremely difficult. If you are someone who consistently finds yourself shooting 15 under and blowing away the field, try popping it on Simulation and see how that goes for you. I’ve also found a couple of funny quirks with this year’s Tiger. With the addition of golfing at night, I noticed that golfers much be huge fans of Corey Hart, because they like to wear their sunglasses at night. Some other niggling things I noticed where that Jim Nantz referred to every round of a Country Club Tournament as “the final round”, he even said “He knows how to hit those shots” while I was playing as Lexi Thompson. While I can only assume there will be a Tiger Woods PGA Tour 15 on PS3 and Xbox 360, this is a great way to end the series for players who will be going onto knew consoles by the end of the year. With 6 new courses as well as Legends of the Majors, Tiger Woods PGA 14 has solidified it’s spot as one of the best golf games in history. As well as a game that show it’s sports history as well at NBA 2K11 and 2K12 were able to do. Tiger Woods PGA Tour 14 is out now on PlayStation 3 and Xbox 360 in North America and is out on Thursday the 28th worldwide.